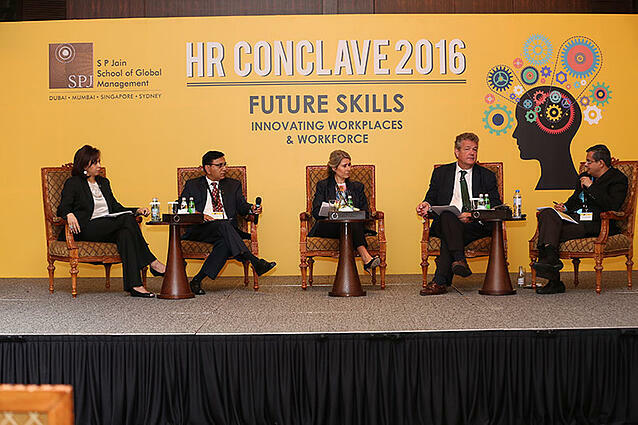 HR Conclave 2016 at SP Jain saw HR Professionals from the top organisations in the Middle East gather to discuss and share emerging HR trends. This year’s conclave explored best practices to tackle the challenges brought on by today’s ever-changing work environment. The emergence of the new-age workplace is disrupting conventional notions of work and workforce. These changes, once seen as a distant future, are the new normal across several industries and organizations. Understanding and adapting to these changes and their associated challenges is one of the top priorities of business and HR leaders as a means of ensuring sustainability and success of enterprises. Aptly themed “Future Skills – Innovating workplaces and workforce”, the Conclave focused on collaborative knowledge creation through research, sharing of case studies and best practices on issues pertaining to organizational innovation and sustainability. The event began with a welcome address from Dr. Balakrishna Grandhi, Dean of Executive MBA at SP Jain, along with a short video presentation on SP Jain’s vision of crafting global business leaders. He also welcomed the keynote speaker for the Conclave - Mr. Samer Kaissi, Country Manager for Danzas AEI and a member of the SP Jain Industry Advisory Board. Mr. Kaissi set the tone for the Conclave focusing on the importance of the workforce and how people are the foundation of any successful business. He also addressed the dynamics of the changing workplace, challenging the audience to embrace a new environment with the increased use of technology. Following the key note address, Professor Christopher Abraham, Senior Vice President and Head of the Dubai campus, SP Jain School of Global Management, presented the key findings of the research undertaken by SP Jain. The respondents included HR professionals spanning South East Asia, Middle East, Australia and India. The distinguished panel of speakers then engaged in thought provoking, interactive discussions related to two inter-related aspects of skills of the future – ‘Transformation of work and workplace’ and ‘Redefining the talent agenda - accelerating the workforce transformation’, through two panel discussions. The first panel, chaired by Dr. Dhrupad Mathur, Director of Industry Interface Program at SP Jain, focused on the transformation of work and workplace discussed how their firms were handling technological changes, and how they were preparing for the future. Fostering flexibility was a key theme with panel members stressing the importance of thinking out of the box. The dynamic environment today needs thinking and practices that are just as dynamic and we need to design workplaces and work timings to be adaptable to these changes. Ms. Hind Al Mualla, Chief of Creativity, Happiness & Innovation at The Knowledge and Human Development Authority (KHDA), described how KHDA has redesigned the workplace and work culture, encouraging employees to focus on their physical, nutritional, emotional and cognitive health, in order improve their wellness at work and at home. 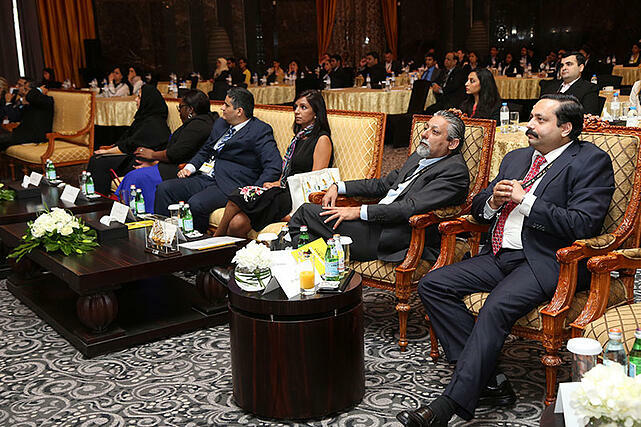 Throughout the discussion, panellists - Ms. Anu Daga, HR Director for DHL Express UAE, and Mr. Karl Gheewala, HR Director for Lenovo Middle East, shared their experiences and explained how HR managers can contribute to changing workplaces. Ms. Tsitsi Mabeza, HR Director for Arabian Peninsula at AC Nielsen, acknowledged the cultural diversity that is now a part of every workplace and how employees need to be adaptable to communicating with different cultures, often communicating with other offices around the globe. The second panel discussion was chaired by Prof. Arindam Banerjee, Assistant Professor of Finance and Director of Student Recruitment at SP Jain. Mariam Elsammy, Chief Marketing Officer of Dunia Finance, said tasks could be divided into operational tasks that could be outsourced and those which required judgement, which should be kept in-house. She also discussed the generation gaps in today’s workforce and how this could be used as an advantage with reversed mentoring and described how Dunia’s programs now start engaging with potential employees much earlier, as early as high school. 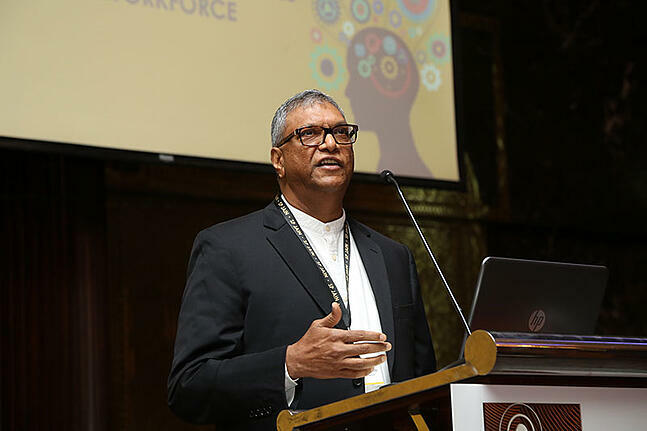 Mr. Francis Matthew, Editor at Large for Gulf News, shared how work and workforce has evolved over time. Dr Nelson D’Souza, Vice President for Leadership and Management Development at Emirates NBD, said it was increasingly important for HR professionals to recognise which staff preferred routine tasks and which disliked them. Ms. Ozlem Dirik, General Manager for Human Resources at Marks & Spencer MENA (Middle East and North Africa), said that with automated checkouts and computerised stocktaking, human interaction would become even more important. After a networking lunch, the conclave continued with a session on global dexterity by Ms. Samantha Miles, Cross Campus Director of Global Learning and Student Life at SP Jain. This was followed by a highly interactive workshop by Professor Christopher Abraham. During this electrifying session, through engaging videos and brainstorming activities, he discussed the practical elements of Design Thinking and how these can be used to disrupt the modern workplace. Mr. Chandrasekhar Singh, General Manager of Corporate Relations at SP Jain, delivered the concluding remarks with a thank you note. Between coffee breaks, lunch and group activities, all participants and guests enjoyed a memorable day, exchanging thoughts and ideas and networking with other HR professionals across various industries. The event was also covered in Gulf News. You may read about it here.